MethSolutions has always held the view that the acceptable levels of meth residues in property should be as high as they can be without compromising health and wellbeing. The recent Meth Report from the Office of the PM’s Chief Scientific Advisor, has determined that for meth related behaviour that is limited to use alone, this should be 10 times greater than the advice provided to the Ministry of Health, following an independent review by Environmental science and Research. Based on the recommendations in the report, it would be easy for people to think that they really don’t need to manage risks presented by meth any more. Such a conclusion is premature. And the risks presented by meth are increasing. The effect of the massive shift in recommended levels, is to reduce the consequence of loss – what it costs to fix up meth contamination. They do nothing to reduce the number of people who are engaged in meth related behaviour. In risk management terms the likelihood of loss. 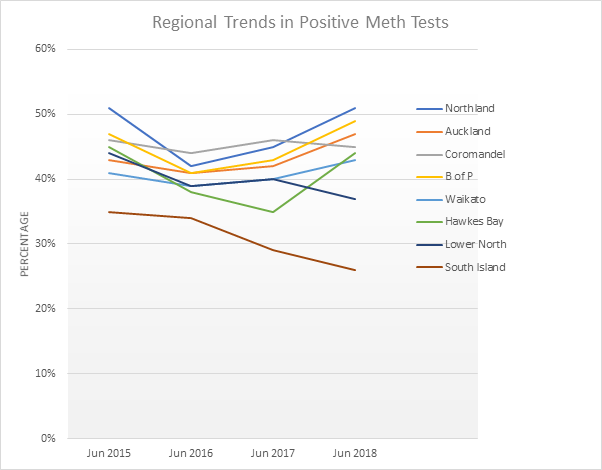 Indeed, it does not take a rocket scientist to work out, that if, like HNZ you remove the check on whether meth related behaviour is occurring, you are far more likely to get people using and/or making meth. 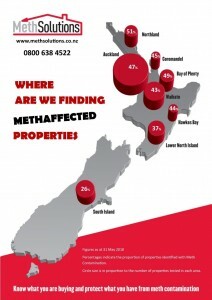 So, a likely consequence of landlords and property manager shifting away from a strategy of actively managing meth related behaviour, is that those inclined to get involved with methamphetamine, are more likely to do so in the properties where meth risk is not actively managed. And the Statistics suggest, that the levels of meth related behaviour are increasing. Having recorded our Statistics from day one, we have an historical record, that is at least 10 times bigger than the dataset ESR reviewed on behalf of HNZ, that was part of the PMCSA Report. This allows us to pick trends both nationally and by region. Each year, the numbers of tests we have done have increased. When we first started, we assumed that the more tests we did, the more the numbers would come down. The table below, shows what has been happening in the last 4 years. The percentage is not the positive test rate in the year that the samples were taken. But the positive test rate of the overall cumulative total. 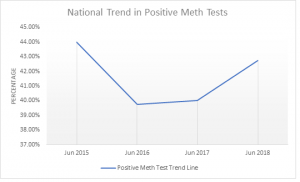 As Property Management industry pundit David Faulkner noted in a recent webinar, 2015 is the year awareness of the risk potential produced by people who are involved with meth hit many people’s radar. It saw a significant increase in testing numbers and the trend line reduced. Since then, the national trend has seen an increase in the number of properties where meth residues have been found. This despite numbers of properties sampled year on year being reasonably steady. Regionally, the trends are shown in the graph below. They show that with the exception of the Coromandel, all regions North of the Manawatu are trending upwards. This suggests, more people actively engaging in meth related behaviour. And if more people are engaging in meth related behaviour, so is the likelihood of loss when it comes to meth related incidents. Is this assertion supported by other data? What do official statistics say? These tables come from a recent presentation I attended given by Police. They reflect the headline number politicians are fond of quoting that says the amount of methamphetamine that is being imported is on the increase. The conclusions of this, less manufacture. 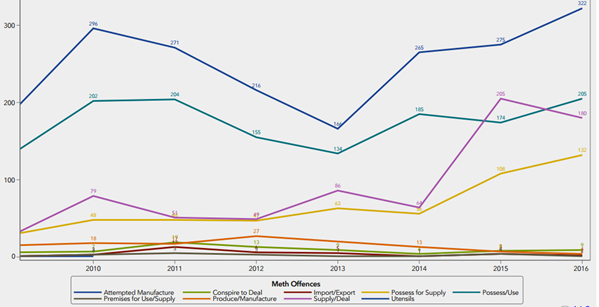 The figures (Supplied by the National Drug Intelligence Bureau) also show an increase in the amount of precursor chemicals being imported. These are the ones used to make meth. 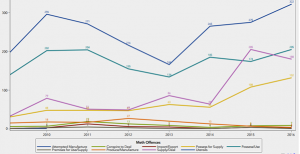 And there is a general increase in meth related offences, particularly in the number of prosecutions associated with meth manufacture, possession for supply and possession for use. Worth noting, is that if meth use is decriminalised, then this would mean 206 less offences on the books, going by the 2016 figures. And if meth use is decriminalised, then it is no longer and illegal act and Landlords lose an opportunity to exit tenants who are engaged in meth related behaviour. This policy shift is already being signalled by Phil Twyford. Add the likely removal of the 7-day notice for health and safety issues under proposed amendments to the RTA, and Landlords really will be stuck with a tenant who has a meth habit. But what is the problem with tenants who engage in meth related behaviour? No doubt there are many people who use meth who have things ‘under control’ and present as normal every day folk who are ‘good people’. The problem, is that as we see in our papers each week, all too often, when people get involved with meth, things go badly wrong. Whether it is a meth lab being busted, an axe through the chest, meth in the urine of a dead 9 month old baby or heavy meth users off to jail for 3 years because of the extent to which they abused their children, there are too many bad stories to count. And if these bad stories are happening in your investment property, you and/or your property manager will have all the joys associated with dealing with this. More common than such dramatic events are things like, problems with making rent payments (meth is an expensive habit), damage to the property, abuse of neighbours and or people doing inspections and parties that can last for days. Not ideal behaviours when it comes to landlord/property manager peace of mind. But, you can’t really mitigate these things if you are not managing the risk. Significantly, given the PMCSA Meth Report has suggested we don’t need to worry about meth residues from use, where meth users are renting a property, there is a greater likelihood of meth manufacture occurring. The thing that even the most cynical people recognise as being a risk. Meth labs are highly mobile. One of the ways meth users get their hands on the drug, is to allow the mobile lab to turn up and manufacture at your house. Another, is to have a go at making it yourself. And the last time Massey University chose to report on this statistic in its annual study of drug use in NZ, around 32% of long term users (roughly 8000 people if the stats are rolled out) had a go at making meth in 2011. So, fail to manage meth in the investment properties you have responsibility for and you increase the likelihood of meth being manufactured and used. All things that improve ROI for the landlord. The very reason people choose to invest in the first place. Typically, the overall positive test rate of the clients we have worked most closely with, has been around 20% below their regional average. 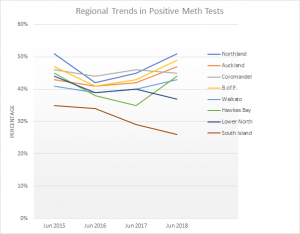 This suggests that standard ‘best practice’ property management systems and processes have some impact on meth related behaviour. But not much. 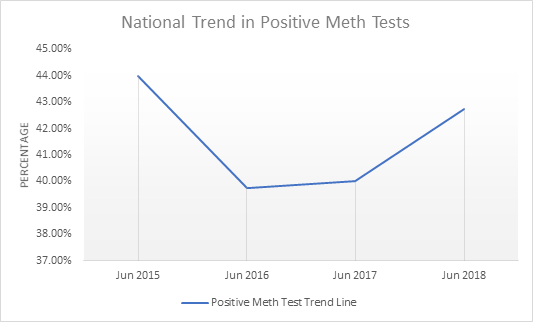 When active meth management takes place, major issues have been avoided completely and minor issues reduce to less than 5%. Yes, these engaged property managers have had to work harder. But importantly, they have exercised the best possible care over their clients’ assets and protected both their clients and their own long-term interests. There is no doubt that transitioning a property to a meth management status, one that makes it more desirable to prospective purchasers, can take effort, it does reduce risk and it does improve performance of the asset. We have unparalleled experience in providing support to property managers and landlords who want to improve investment returns. A smart investor and property manager will be looking to work with those who help protect their assets, rather than listening to those who suggest that all is well in a world made profoundly more risky by the recommendations of the PMCSA Meth Report. Contact us if you want to know how our unique approach to management of meth risk can help Landlords and Property Managers improve investment returns by reducing risk!